Macrophages have a multifaceted role in wound healing. While their initial activity may be in the degradation and elimination of damaged tissue, macrophages also produce and secrete a variety of mediators that can participate in the repair process as well. To perform these functions, macrophages must be recruited to a wound site. 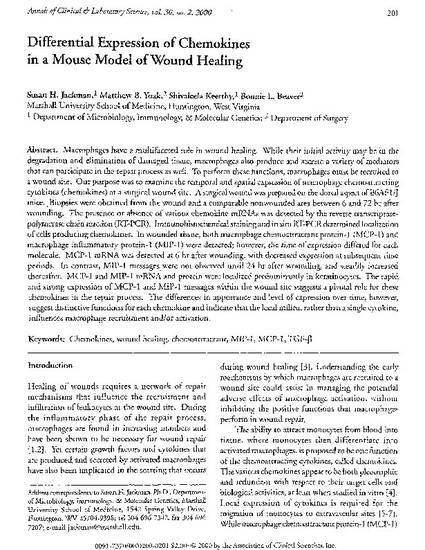 Our purpose was to examine the temporal and spatial expression of macrophage chemoattracting cytokines (chemokines) at a surgical wound site. A surgical wound was prepared on the dorsal aspect of B6AFI/J mice. Biopsies were obtained from the wound and a comparable nonwounded area between 6 and 72 hr after wounding. The presence or absence of various chemokine mRNAs was detected by the reverse transcriptase-polymerase chain reaction (RT-PCR). Immunohistochemical staining and in situ RT-PCR determined localization of cells producing chemokines. In wounded tissue, both macrophage chemoattractant protein-1 (MCP-1) and macrophage inflammatory protein-1 (MIP -1) were detected; however, the time of expression differed for each molecule. MCP-1 mRNA was detected at 6 hr after wounding, with decreased expression at subsequent time periods. In contrast, MIP-1 messages were not observed until 24 hr after wounding, and steadily increased thereafter. MCP-1 and MIP-1 mRNA and protein were localized predominantly in keratinocytes. The rapid and strong expression of MCP-1 and MIP -1 messages within the wound site suggests a pivotal role for these chemokines in the repair process. The differences in appearance and level of expression over time, however, suggest distinctive functions for each chemokine and indicate that the local milieu, rather than a single cytokine, influences macrophage recruitment and/or activation. Jackman, S. H., M. B. Yoak, S. Keerthy, B. L. Beaver. 2000. Differential expression of chemokines in a mouse model of wound healing. Ann. Clin. Lab. Sci. 30: 201-207.